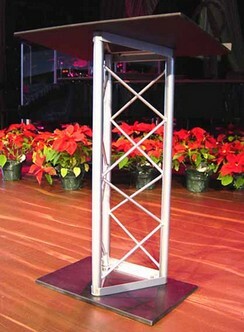 Fits into all surroundings: schools, churches, and any other group that wants to enhance the look of their podium. The upright structure can be ordered in either powder coat black, titanium (silver). Base is constructed out of a 3/4" black polypropylene material and measures 16" X 24." The top is 1/2" black polypropylene and measures 18" X 30" The height of the top from the floor is 43" on the low end and 45" on the high end. Weighs 37 lbs. Custom heights and custom upright colors can be specially ordered. Allow 2-3 weeks for delivery of custom lectern. See additional Lecterns by clicking on Lecterns on left navigation.